Apple is investigating a series of reports about battery problems with some of its new iPhone 8 Plus phones. Over the last week, six reports have come to light which show the phones splitting apart soon after they start to be used. In all cases the battery inside the phone has swollen rendering the phone unusable. It is not yet clear whether the swollen batteries are a few isolated cases or are indicative of a bigger issue. The first report about an affected iPhone 8 Plus came from Taiwan. Phones with similar problems have now emerged in Japan, China, Canada, Greece and Hong Kong. In a statement, Apple said it was aware of the reports and was "looking into" what might have caused the fault. 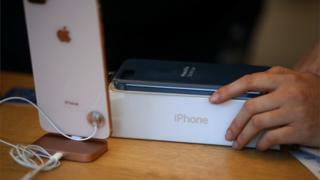 Apple news site MacRumours, which reported the first incident, said given the huge number of iPhones that had been manufactured it was "common" for there to be a "very low percentage of defective units". In a blog, Sam Jaffe, from analysts Cairn Energy Research Advisors, said battery bloat typically happened at the end of a battery's useful life. To have it happen soon after a product launch was troubling, he said. "It could be a minor distribution of a random manufacturing error," wrote Mr Jaffe. "If it's a little bit more than that, Apple might quickly be able to identify the battery manufacturing line that's responsible, shut it down and keep making iPhone 8s without any more issues," he added. Apple's problems follow Samsung's experience with its Galaxy Note 7 last year. Hundreds of faulty Galaxy Note 7s were reported as faulty soon after that device launched. The scale of the failure prompted Samsung to recall and discontinue the handset. The problem was traced to a design flaw.